The other day I stumbled upon this nifty lemon-mint ice cube recipe and I thought they would go perfectly with mojitos. Guess what, they sure did! I made some yesterday afternoon and by the evening they were ready to go. I have some leftover, so I'm planning to jazz up my mineral water with them today. The best part: the mixing possibilities are endless. You can swap lemon for lime, berries or even watermelon. Here is the how-to. Would you try it? Ooooohhhh these would go perfect in a mojito or iced green tea! Amy, you will love it! Great idea, Jess. 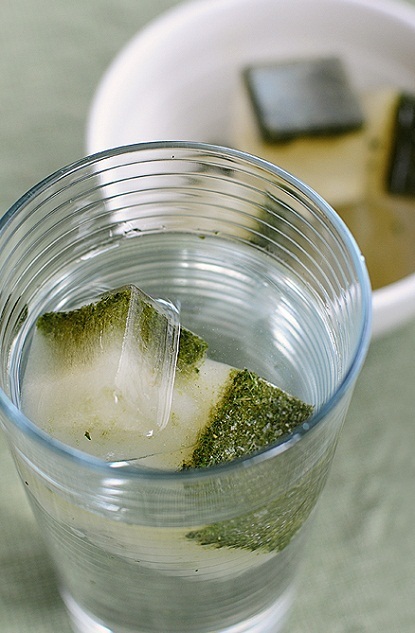 I love iced green tea - yum! Yum! I would definitely try! Wow! awesome looking dish I just want to try it now.